Effectively replaces SB13, Reference SB3000 hosts carnal output and extreme LFE allowing stunning refinement and musicality that outperforms anything in its size or price range. Earn 1275 loyalty points when you order this item. SVS SB-3000 incorporates a fresh 13” high-excursion driver powered by 800/2500W RMS/Max Sledge amplifier with totally discrete MOSFET output. Measuring just above 15” cubed, SB-3000 surpasses much larger subwoofers and dominates a room sonically without sticking out visually. Unprecedented reference subwoofer performance differentiates the SB-3000 from anything available. A complex 800W RMS, 2500+ Watts peak power Sledge STA-800D2 DSP amplifier, innovative 13” high-excursion SVS driver and an enhanced sealed cabinet design command a room with deeper bass and higher output than usually possible from a comparatively compact subwoofer. Moderately rated at 800 watts RMS, 2,500+ watts peak power, the Sledge STA-800D2 Amplifier with wholly discrete MOSFET output produces plenty on-demand current to totally optimise the potential of the high-excursion 13” driver. The high-efficiency Class-D topology with huge 25 Amp 600V MOSFETs create easy on-demand power while exerting pinpoint control for pure clarity high output. 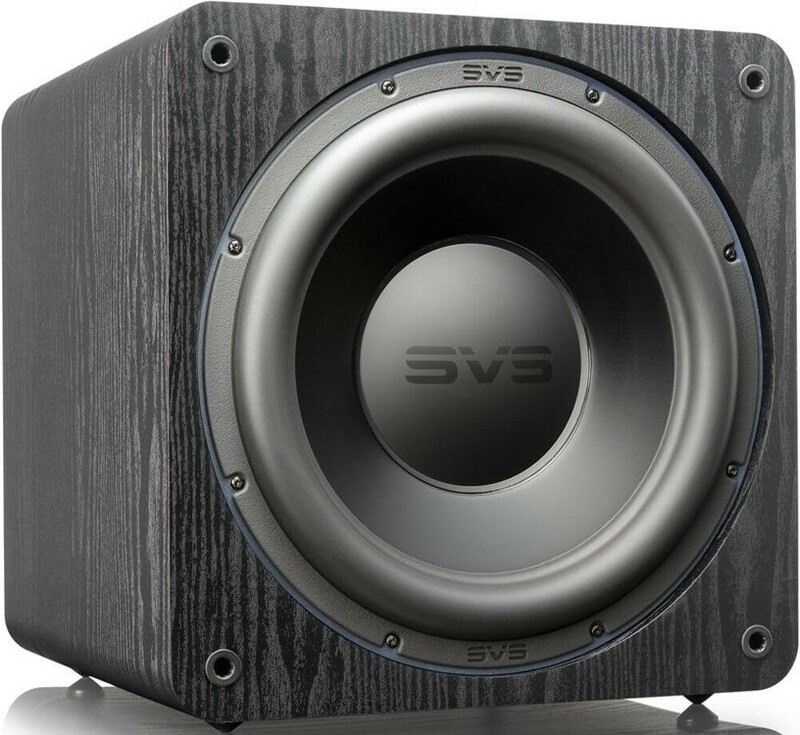 Fully new 13” SVS driver incorporates an aluminium vented cone with composite fibre dustcap holds excellent rigidity-to-mass ratio that coerces a room with low-frequency sound waves while retaining crisp speed in transients with pinpoint accuracy. A patented injection moulded extreme-excursion gasket for the long-throw parabolic surround guarantees ideal pistonic motion for longevity, control and precision. This is arguably the most superior processor ever used in a consumer subwoofer with precision 56-bit filtering enabling blending with any speakers through advanced in-room tuning, augmented frequency response curves, dynamic DSP controls and more. The easiest way to control SB3000’s volume and organise custom presets for movies and music with one-touch tuning. It functions with Apple iOS and Android devices to reveal the full force of the 3000 Series via DSP function control including volume, 3-band EQ, low pass filter, phase, polarity, room gain and settings. Advanced customisation lets you name your sub for easy switching, choose standby mode and reset to factory settings. Bluetooth connectivity gives full control even when the sub is out of sight and bi-directional feedback displays adjustments on the app and rear interface. ICI (Intelligent Control Interface) on the rear panel hosts touch buttons and LED bar simplifying DSP adjustments of volume, low pass frequency, phase and more. Adjustments can be made based on listening preferences and content for full and balanced bass response. Low pass filter ensures smooth sonic transitions and seamless loudspeaker blending and phase control to align timing of subwoofer output to speakers or additional subs. Double-thick MDF and wide internal bracing in the acoustically-elevated SVS 3000 cabinet design results in a resonance-free setting. Acoustic insulation removes all coloration or resonance even when deepest lows are played at reference volume. Protective, non-resonant steel mesh grille and custom elastomer feet reduce noise within a room.